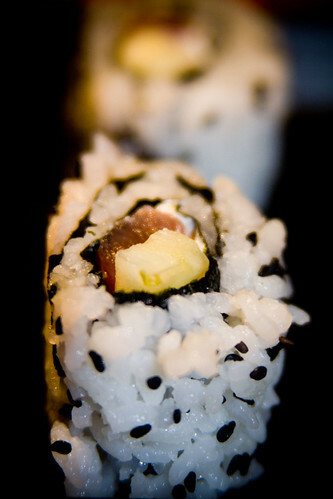 This is very similar to the Naked Spicy Tuna Roll except not spicy… no jalapeños! Oh, and it’s inside out, and has sesame seeds, and I actually tried this one. 🙂 A perfect alternative for those of us who can’t take so much spice! * After you spread the rice on the nori but before you flip the nori over, sprinkle some sesame seeds over the rice and press them in so they stick. Under ‘cooking directions’ step 4 – is the sliced jalepeÃ±o a misprint? Curt – o_0 Oops! Fixed! iang – Well then, perhaps I shall have to make all those versions and see which one you New Yorkers like the best! 😉 Thanks for that link! Hmmm – a New York roll would contain a Nathan’s hot dog and sauerkraut, wouldn’t it? It looks so good to us, you can call it what ever you want! I would love to have some of that right now, even with the jalapenos! White on Rice Couple – 🙂 Thanks! It certainly is delicious! I’m going to assume that they are calling this a “New York” roll cause of it’s similarities to a “Philly Roll” in that both have cream cheese. In all honesty though I always thought that the “philly roll” has more in common with New York and Philly. The “Philly Roll” has smoked salmon and cream cheese is just a bagel away from being bagel cream cheese and lox. Of course the bagel and lox being one of the, at least that I’ve always heard, classic deli options in New York. Hi Anonymous, thanks for your thoughts! You certainly bring up some interesting points! I have heard the argument for the Philly Roll being called a New York Roll before, but since the Philly Roll is so well known, I doubt that will happen anytime soon. Yeah… what anonymous said is what I was thinking. lol. I’d guess the NY roll comes from the idea of a bagel with cream cheese and lox, but that would be more appropriate for smoked salmon instead of tuna. Oooh now there’s a good idea! I’ve never had a roll with pastrami… sounds delicious! 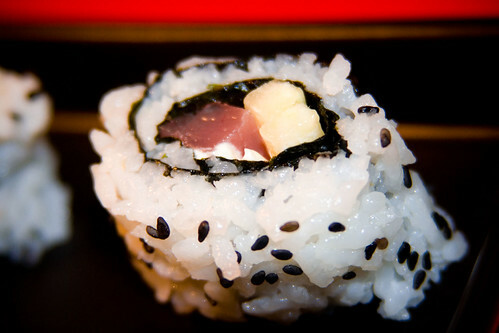 Other then arguably the Philadelphia Roll, the California Roll is the only roll named after an american location which can consistantly be expected to have roughly the same ingredients. Very true, those are the two most widely popular rolls, so it’s rare that anyone deviates from the typical recipe a whole lot. Nice recipe/tutorial..I will be preparing this for my wife’s anniversary..